The What: At ISE 2017, Audinate unveiled its Dante Domain Manager platform, a complete network management solution bringing enterprise-grade system administration to the AV world. 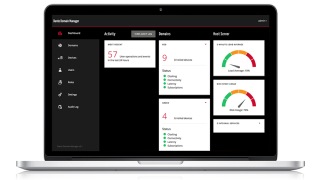 Dante Domain Manager is designed to make audio networking more secure, more scalable, and more manageable than ever before. The What Else: Dante Domain Manager allows administrators to secure their audio networks from unwanted changes and modifications, and provides the ability to scale and segment audio networks regardless of the physical constraints of the network. With Dante Domain Manager, integrators can define specific AV device groupings, by room, building, and site, allowing for the creation of independent Dante Domains and enabling a single Dante Domain to encompass multiple IP subnets. Dante Domain Manager provides robust security for IT departments and AV managers, including user authentication and control, role administration, and integration with Active Directory. System managers also can gain visibility and accountability through a suite of user-defined dashboards, audit trails, alerts, and messages. The Bottom Line: The network domain concept was first successfully pioneered by the IT industry to differentiate and manage multiple private networks within the same infrastructure. Audinate is applying this same approach to AV, customizing the features to the needs of AV professionals and end users and providing the community with the opportunity to deploy the best strategies and best practices of both AV and IT. Dante Domain Manager will be available in the second half of 2017.